Welcome to Wild Wednesday! This series showcases the best of the extra-exciting canvases from our APC customers! Whether the subject is untamed nature, a thrilling extreme sports shot or an intense portrait, they're captured on camera by a photographer, and captured on canvas by the APC team. If it's WILD, it must be Wednesday! “I work as a volunteer animal keeper and photographer for Animal Ark Wildlife Sanctuary, which is located about 25 miles north of Reno, Nevada. Animal Ark is a lifetime sanctuary for animals that for different reasons are not able to survive in the wild. We have orphans, injured animals, retired show business animals, and illegal pets. We also have three cheetahs that were born in captivity, and serve as ambassadors for cheetah conservation worldwide. Animal Ark was a pioneer in research that determined it is very important for cheetahs to run at high speed for their health. Prior to these "run programs", cheetahs were one of the few species that had a shorter life expectancy in captivity than in the wild. These run programs have reversed this situation and we even have a 15 year old cheetah that still runs. “Animal Ark holds public cheetah runs about once per month in the summer. The cheetahs run off-leash, at high speed, close by the spectator stands. We also have a series of photo blinds that are at the bottom of the "U" shaped course, and give unequaled views of running cheetahs to photographers. That's where this image was taken. 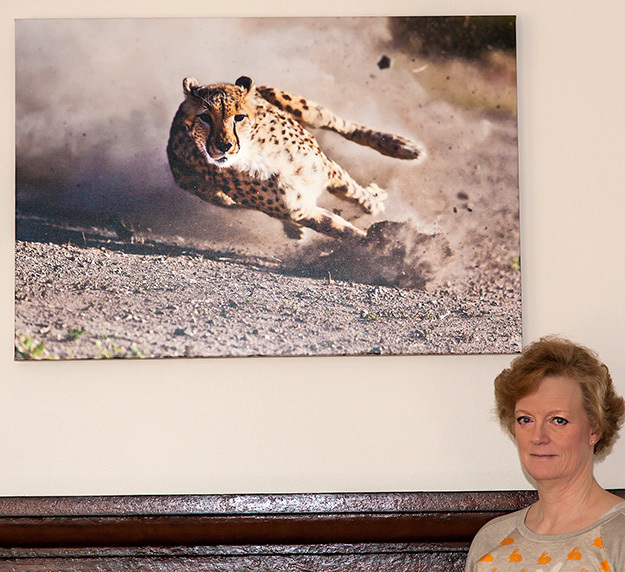 “Inspiration for the image was just the pure beauty of these animals in high speed action. This photo came from one of the first cheetah runs that I photographed. Since then I probably have a thousand more photos, but this is still one of my favorites. Think your canvas is wild? Contact us and maybe we’ll feature YOU!